The Producers is the record breaking 12 Time Tony Award winning production by Mel Brooks and Thomas Meehan, based on the 1968 Mel Brooks movie of the same name starring Zero Mortel and Gene Wilder. Brooks not only adapted the show but also wrote the lyrics and composed the music, which was arranged by Glen Kelly and Doug Besterman. The show opened in 2001 starring Nathan Lane and Matthew Broderick in the leading roles. Lane and Broderick would later return to the roles again in the 2005 movie adaption of the musical. Since opening The Producers has been professionally performed in multiple countries all over the world, including in Canada, Australia, South Korea, Japan, Mexico, Brazil, Denmark and Russia. In 1959 New York, Max Bialystock, the onetime king of Broadway producers hungry to strike it rich, and Leo Bloom, an accountant with dreams of someday becoming a theatre producer, discover that they could get richer by producing a flop than a hit and start by finding the worst show, worst director, and worst actors. When their new production, “Springtime for Hitler,” turns out to be a smash success, the plan is thrown off and the partners lives are thrown into chaos. Leo is Max Bialystock’s socially awkward and mousy accountant. However, despite his meek demeanour Leo is a hesitant optimist who longs for something more and eventually accepts Max’s offer to become a Broadway producer; even if it is just a scam. Requirements: Strong comedic acting, singing and high dance/physicality skills. American accent. Ulla is a young and hopeful actress who has travelled to America from Sweden to become a Broadway performer. Though her beauty might eclipse her talent, Ulla is passionate about life and art. Ulla is a seductress, but is also often clueless. Requirements: Strong comedic acting, singing and high dance/physicality skills. Swedish accent. The German loyalist playwright, from his lederhosen to his pigeon, Adolph, his love for the motherland is unmistakable. He is imposing yet tender. Requirements: Strong comedic acting, singing and high dance/physicality skills. German accent. New York's most famous and flamboyant stage director, Debris surrounds himself with deliciously beautiful clothing, people, and possessions. In a crowd, it would be impossible to miss him. Requirements: Strong comedic acting, singing and dance/physicality skills. American accent. The Ensemble plays a crucial role within the Producers, required to fill in the many varying characters that inhabit almost every scene. From theatregoers and Showgirls to old women and Stormtroopers. The role of the ensemble will be extensive and exciting. 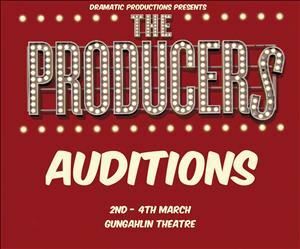 Being part of the ensemble of the Producers will require energy, stamina and the ability to change between a myriad of characters throughout the show. Vocally, the production team is looking for the 1930’s/40’s/50’s Hollywood sound. Not the 90’s musical theatre. Chorus will need to be able to hold a harmony part up to 5-part division each for both women and men. The audition panel will be looking for people who can bring great movement and character, as well as comedy to their performances. Requirements: High dance ability (tap desirable). Some comedic acting skills are also highly desirable.